Dubai: Staff working in beauty centres and barber shops should get a valid occupational health card issued by the Dubai Municipality clinic before they start their jobs, says Hafid Guloom, head of health control section, Dubai Municipality. 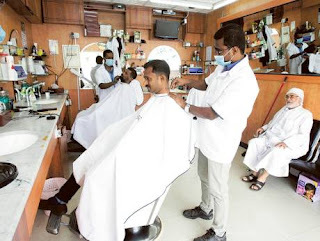 It may be recalled that Dubai Municipality launched an initiative during the last week of Ramadan in July to inspect beauty centres and barber shops for compliance with public health and hygiene standards. Inspections were carried out preceding Eid Al Fitr given the increase in number of customers visiting such establishments in preparation for the festivities. Dubai Municipality constantly endeavours to remind the public about health and safety precautions to be taken when visiting beauty centres. Guloom told Gulf News that every beauty centre must follow basic rules and regulations set down by the municipality to ensure safety and hygiene. For example, the municipality even checks on the number of towels or aprons available at salons to ensure that there is sufficient stock to ensure that every customer gets a fresh piece. The salon staff must maintain personal hygiene at all times when attending to customers. “Following good practices in personal hygiene such as regular hand washing, nail maintenance, avoid wearing metal jewellery, wearing appropriate footwear that covers the entire foot, cleanliness of hair and clothes and not smelling of smoking cigarettes are important, said Guloom. He added that each employee must have three sets of uniforms and he or she should keep them clean. In the health requirements for barber shops, he said it is clearly listed that tools “must be cleaned mechanically after each customer by washing them with warm water and a brush as the first stage in preparation for sterilisation”. As for women’s salons, the health requirements clearly state that formulating beauty products or blends in-house is strictly prohibited and such products cannot be used or sold to customers. If a cosmetic product is being used, it must not be used directly from the original container but first transferred into a smaller clean bowl with a spatula before application. As a customer, you can insist on this, if you see it happening otherwise. “Salons must ensure that all products, including cosmetics and dry henna, are registered by Consumer Products Safety Section in Dubai Municipality before buying from suppliers and registrations certificates must be presented during inspections,” explained Guloom. Sylvia Henein, a 28 year-old Egyptian resident in Dubai, says that her top priority for selecting a salon is the cleanliness of the staff and clean floors. Sylvia added that when seeking cosmetic-related services, she makes an effort to ask staff about the kind and brand of products used before agreeing for the procedure. “I usually ask about the brand of hair-dye that will be used on me. I have been going to a salon I trust won’t mix or blend products that will harm my scalp or hair,” she says. Albert Fancisco, a 31-year-old Filipino resident, clarified that he has visited numerous barbershops across the city and has learned to choose wisely. “I used to go to a salon located in Bur Dubai but the place was small with cheap service so it was always crowded. The floor was covered with hair and littered with tissues with hair in them,” he says. Francisco makes it a point to ask the barber to change the blade before getting a shave. Staff should wear gloves, he says, rather than using their bare hands, especially during facials. “I also noticed that many salons do not provide sanitiser pumps in the store, which I consider important for personal hygiene,” Francisco adds. Jordanian Salwa Ruwaished, 25, said she chooses her salon based on online reviews and ratings as well as recommendations from friends. She says she does not mind paying a premium for services at the salon she visits because the staff are clean, professional and she is always happy with the outcome. She doesn’t ask for any particular brand when it comes to the hair dye but her hairstylist assures her that the salon uses only the safest brands.